I don't usually wait this long between posts but because of our new product line, the demand is now reaching levels that I am barely able to keep up with. If you have been following my sporadic posts, you will know that we have created, what I truly believe, to be the best of the best in Pancake Syrups and Ice Cream/Dessert Toppings. Not only because there is no other flavor like them anywhere on America's store shelves, but the way in which they are made distinguish them in the same way. Let me briefly explain. At the beginning of winter, I took my (then 6 year old)son to the supermarket for some pancake syrup. We had just bought our first waffle maker and he and I was excited to use it to create some great waffles. 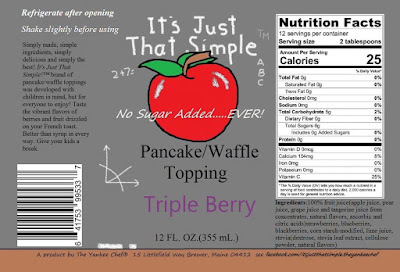 While standing there, I noticed something that never hit home before....there is only one kind of syrup available on the market for the general consumer to purchase to drizzle over pancakes, waffles and French Toast. And that was maple syrup. Now mind you I am a full blooded Yankee and adore my maple syrup. But at that particular moment, I realized there is more to pancakes and waffles than sugar, sticky syrup. I wanted something with MORE flavor. Something that would pique a child's interest and at the same time, not inundate his blood with table sugar or high-fructose corn syrup. 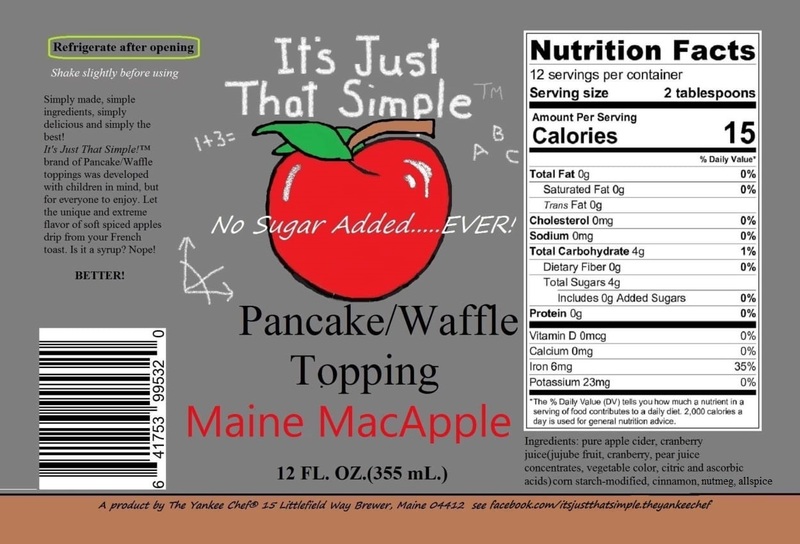 Not only was there 10 kinds of maple syrup, but on each and every label, the same first two ingredients made me realize I needed to do something for my child, as well as other children and adults that may have to contend with any blood sugar issues. I got to work, but not before I decided to walk up and down every other isle to see if there was another item I can do something about. It wasn't long before I saw, on an endcap, some sundae toppings being sold. Of course there were only a couple to choose from and both were made by popular brand and both had the same exact first two ingredients as the syrups did, sugar and high fructose corn syrup. Well, that did it! Time to get myself back in the kitchen but with a purpose this time. The result? Here are all 7 of my labels, with 2 more coming out before fall. The two that are due out in the fall are Sour and Sweet Sauce, which is literally what this type of sauce should be, sour you can actually taste and sweetness the way it should be, pure berries and fruit. Sweet Pineapple-Tangerine Syrup is my final product that I think you will be amazed at how sweet it came out! One look at the calories, total sugar and ingredients I hope will have you switch over and at the very least, give them a try. My sugar free products rely on the sweetness of berries and fruit, with a touch of natural stevia to boost the natural sugar flavor, just in case your children are addicted to the sugar mess we are guilty of feeding them. The taste of each product is explosive! Not just the sweetness, but with the flavor written on each label. The New England Apple Pie is, so far, the best selling ice cream topping I produce. 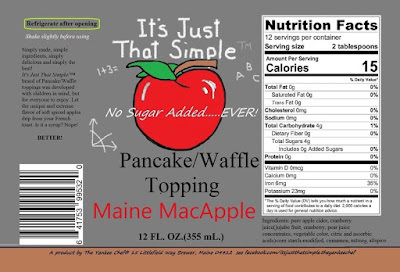 And to compliment this, the Maine MacApple Syrup is...well, simply close your eyes and you will swear you are tasting an old fashioned, New England made apple pie! 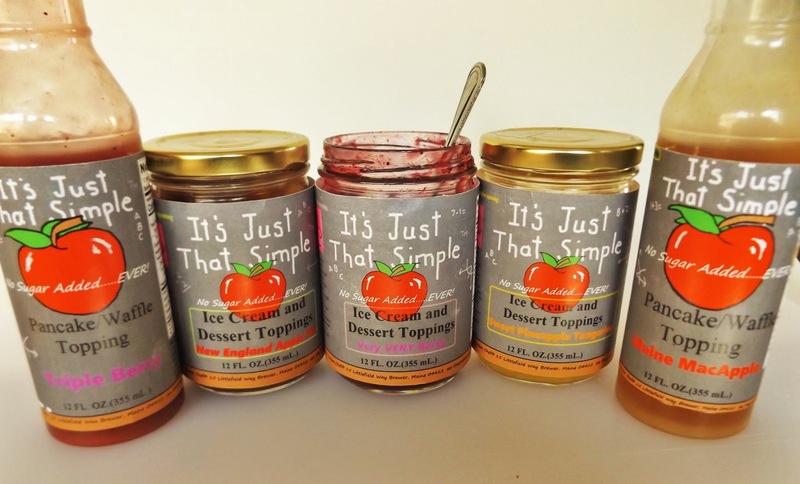 And another great thing about these toppings and syrups, they are completely interchangeable. If you want something chock full of fruit and berries on your waffles, grab the jar of ice cream topping. 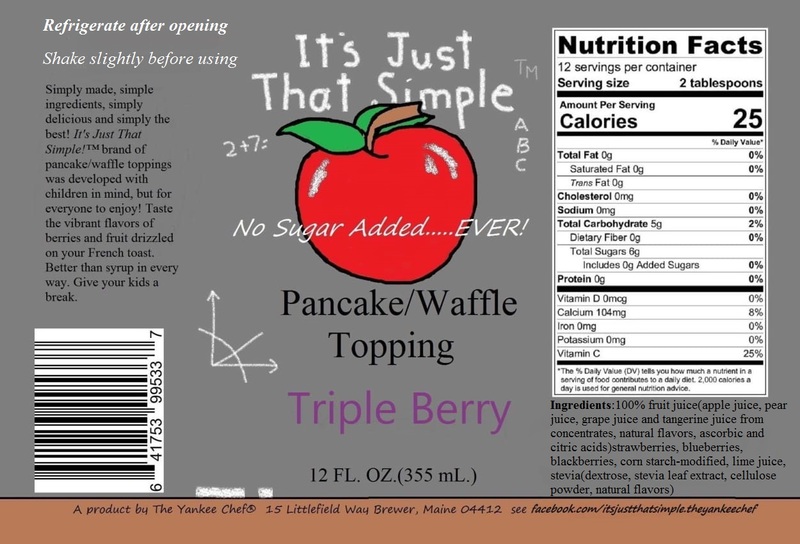 If your child doesn't care for the texture of whole berries and chunks of fruit, purchase the syrups. Either way, you(as a parent)will absolutely LOVE these products! I could go on and on, but I think I would rather have you taste them for yourselves. Unfortunately, I am only equipped to offer them through my facebook page and a dozen or so stores in my local area. Think that breakfast and ice cream are the only uses for these? Think again and check out my facebook page here for some great, super simple recipe ideas. And by the way, I intentionally kept my price at the bare minimum so that there is no excuse for parents of all income levels to purchase these treats for under $5....ANYWHERE!